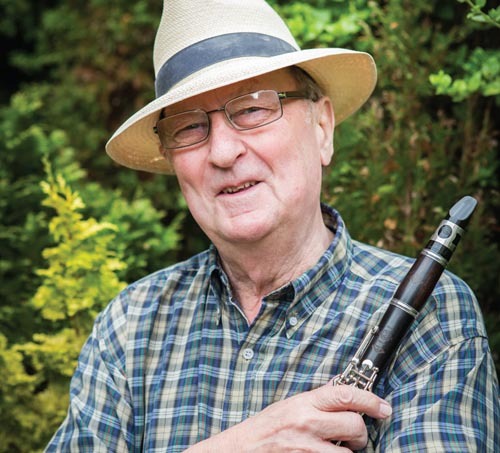 Clarinettist Peter Kerr is now a best-selling author, but back in the day, he was a member of the Clyde Valley Stompers. The Stompers were led in the 1950s by trombonist Ian Menzies and Pete was brought in to replace clarinettist Forrie Cairns. Eventually, Ian Menzies left and Pete took over leadership of the band. The Clydes were one of the most popular bands during the 'Trad Revival', not just in their native Scotland, but in the rest of the UK and beyond, recording, touring and appearing on television and in movies. 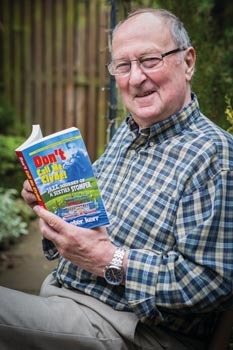 Peter's personal story and that of the Clydes is in his very readable, interesting book Don't Call Me Clyde (2016). Peter went on to become a freelance producer - the recording of Amazing Grace by the Scots Dragoon Guards in 1972 became the biggest-selling instrumental single of all time. The recordings he produced were from a variety of genres but included amongst them were albums by Alex Welsh and his band. Still based in Scotland, Peter also ran his own farm in East Lothian until, at the beginning of the 1980s, he and his family moved to Mallorca to take on a run-down orange farm. He started to write. His Mallorcan-based travel books - Snowball Oranges, Mañana Mañana (Now published as One Mallorcan Summer) , Viva Mallorca! and A Basketful of Snowflakes sold worldwide and have been translated into fourteen languages. Snowball Oranges won a bronze prize in the 2002 American 'Book of the Year' Awards and Mañana Mañana was shortlisted for for the WH Smith 'Book of the Year' Awards. Hello Peter, Good to see you. Can I get you a coffee or tea? Coffee, please, Ian. Decaff, if poss. I have a low swingng-on-chandeliers threshold. Just a squirt of milk, please. Semi-skimmed, if poss. Watching the cholesterol levels these days as well. Looking back, Peter, I believe you had your own band before you joined the Clyde Valley Stompers? Oh, you mean the Hidden Town Dixielanders - the band was named after its home town of Haddington, the old East Lothian market town with a valley location that, it is claimed, once caused it to be referred to as 'The Hidden Town'. L to R: Jack Blair (trombone), Kimber Buglass (trumpet), Jim Douglas (guitar), Bob Sandie (drums), Pete Kerr (clarinet), John Logan (bass). It’s a while now since the high rolling days of the Clyde Valley Stompers. They were a top band during the high times of traditional jazz. How did you come to be involved? It was early 1961, not long after my twentieth birthday. The Clydes, having outgrown the Scottish jazz scene (in commercial terms at least), were shifting their base from Glasgow to London. 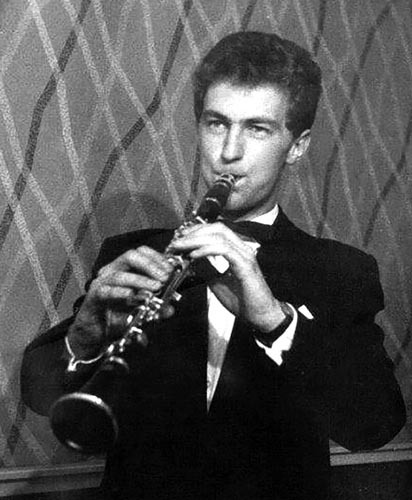 Their clarinettist Forrie Cairns opted not to make the move, and I was asked to take his place. I'd just returned to Scotland after spending two months in Germany with my own band, and as we had no work lined up, I was extremely glad of the offer. Ian Menzies, the trombonist-leader of the Clydes, had heard a couple of singles my band had recorded the previous year, and must have thought I was worth taking a chance on. Even although I was the first east-of-Scotland musician to join the staunchly Glaswegian Clydes, everything worked out fine. OK, they beat me up a few times, just so I'd know my place, but they were careful not to break my fingers. But seriously, it was the start of a few extremely eventful but mainly enjoyable years, during which I became leader of the band and did my bit, aided and abetted by a succession of really fine musicians, to help the Clydes achieve unprecedented success, hitting the charts with our George Martin-produced single of 'Peter and the Wolf' and even featuring in a couple of popular British movies of the time. 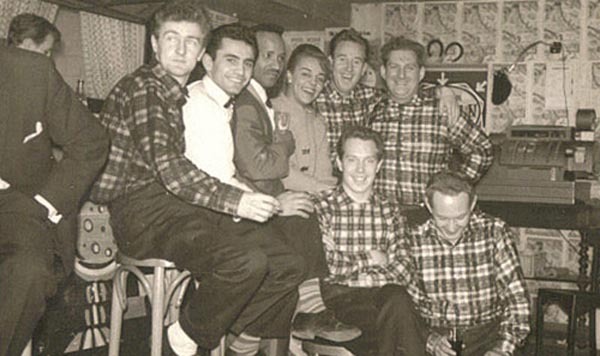 Back row: Pete Kerr (clarinet), a Turkish waiter, Frank Holder (ex-Dankworth cabaret guest), Mrs Holder, Alex Shaw (piano) and Ian Brown (bass). Front row: Andrew Lauder (trumpet), George Crockett (drums). Missing is Jim Douglas (guitar/banjo) who was behind the camera. Unfortunately, success generated financial tensions between the band and its management company, which heralded the end of the Clyde Valley Stompers - ironically, at the height of their hard-won fame. the Clyde Valley Stompers climbed to a high of No.25 with their Parlophone recording. 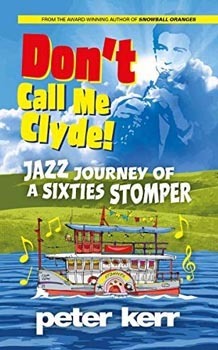 You wrote a book about the band – ‘Don’t Call Me Clyde’, subtitled ‘Jazz Journey of a Sixties Stomper’ – what are your two favourite anecdotes from the book? The book, which is also an affectionate recollection of life during the austerity-gripped years following the Second World War, does chronicle the ups and downs of my time with the Clydes, including details of what actually brought about the band's untimely demise. But the good times far outweighed the bad, and there were plenty of laughs along the way. One such involved Alex Shaw, the exceptionally gifted Edinburgh pianist, who, while playing with my own band in a jazz club in Mannheim, Germany, was suddenly gripped by a coughing fit. It was on a gala night during the local Karneval celebrations, and the club was packed with people following the Karneval Queen, her 'Princesses' and attendant local dignitaries on a round of the city's night spots. In mid-cough, Alex sneezed, and his false teeth shot skittering across the dance floor like a pair of runaway clams. A plague of mice darting around their feet wouldn't have elicited more screams from the Queen and her ladies-in-waiting, or spurred them more readily into a Teutonic version of a right old East End knees-up. And the band played on - though only just! On another occasion, when the Clydes were preparing to go on stage during a jazz band jamboree at the De Montfort Hall in Leicester, I noticed the tip of my clarinet reed was slightly frayed. The usual way of fixing this problem was to burn off the offending 'frills' with a match, using a penny as a template. I didn't have any change on me, so I asked the rest of the boys if anyone had a penny I could borrow. Our pianist Bert Murray, who was noted for his acerbic sense of humour, dipped into his pocket and threw me a two-shilling piece. 'Here's two bob,' he said, 'burn the whole f****n' instrument!' Laughs all round. I thought Bert had been kidding, but I took comfort from the knowledge that, in any event, he had insulted many better musicians than me in his time. Also, I helped myself to the last laugh by trousering his two bob bit! 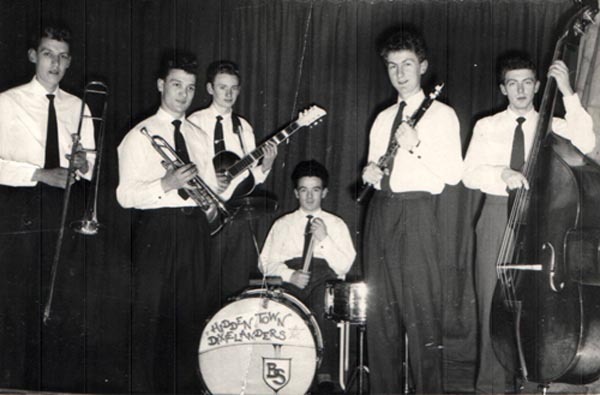 Did you have another band after The Clyde Valley Stompers disbanded? Yes, I led Pete Kerr's Scottish All-Stars for a while from 1964. If memory serves me right, I think that all of these guys, with the possible exception of Mike Scott (trumpet) were actually roll-overs from the Clydes. 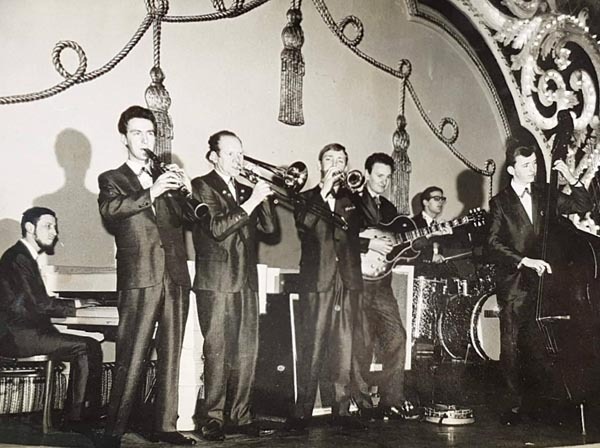 L to R: Mike Oliver (piano), Pete Kerr (clarinet), John McGuff (trombone), Mike Scott (trumpet), Jim Douglas (guitar), Billy Law (drums) and Ron Mathewson (bass). 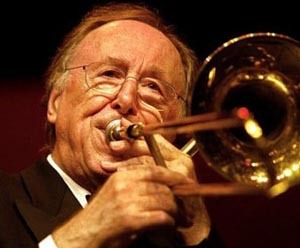 In some ways, the time of Ball, Barber, Bilk and the Clydes seem long past, and yet Chris Barber at nearly ninety is still touring and drawing large audiences, why do you think that is? For a start, he must be blessed with an exceptionally robust constitution, although he must also have looked after himself more carefully than many other jazzers have done while attempting to cope with work schedules less daunting than his. Also, for someone who did so much to influence the way mainstream popular music has since developed by providing an early platform for such relatively obscure genres as Skiffle and Blues, he has never lost touch with his own musical roots, while never shying away from exploring other avenues either. I suppose his enduring appeal to audiences over so many decades is largely down to the fact that he knows what they want and is genuinely happy to provide it, but without compromising his own tastes and standards. There's an honesty there that audiences recognise and appreciate. Not to be ignored, though, is the fact that he has always surrounded himself with good musicians, and their long-lasting relationships with him are testament to a mutual respect that is rare indeed. People tend to forget that Chris Barber plays double bass as well as trombone - you talk about his work with different genres, did you know that he recorded Muddy Waters' I Can't Be Satisfied with guitarist Rory Gallagher for his Memories Of My Trip album in 2011? Do you have a favourite past jazz clarinettist you wish you could have met? There are several, but topping my list would be Benny Goodman. He was not only a superlative jazz man, but also an absolute master of his instrument, and a truly original stylist whom many have tried to emulate. I didn't kid myself I'd ever get anywhere close to matching his artistry, but I did listen to him avidly when I was starting out on clarinet, and I still play his records regularly - particularly the early small group material. If there had been the chance to play a duet with him, what tune would you have played? Memories of You would be the one. It's an attractive melody, a perfect showcase for Benny Goodman's flawless tone and technique, and a tune I actually had the temerity to play as a clarinet feature myself. So at least I know how it goes, and would be able to find appropriate places to tootle away inconspicuously while Benny turns on the magic. Here's a video of Benny Goodman playing Memories Of You in Japan in 1980. I’m forgetting my manners! Would you like a biscuit? Let’s see – I have some chocolate digestives, but they might be a bit stale, or there are some ginger nuts that are fresh, a few Hob Nobs or some Garibaldis? I don’t suppose you are into the deep fried Mars bars that apparently emerged from Scotland? I have to confess that I've never tried a deep fried Mars Bar, Ian. It's not that I don't think it would go OK with the chips, but I reckon there would be a definite gastronomic clash with the pickled onions. Besides, I'm watching my sugar intake at the moment as well. But I do fancy a biscuit, and of the tempting selection on offer, your ginger nuts look most salubrious. Great dunkers, too, I'm told? Ginger nuts have been my favourite dunkers since I was a child! I recently watched a documentary on television saying how the growth of snacking is contributing to obesity in the UK, but I'm sure that if you dunk a biscuit it must dilute it a bit? Are you still playing your clarinet, or are you mainly writing now? Haven't blown the clarinet in earnest since I puffed out a few trills on a Krankies' album I was producing back in 1982. I wrote their 'Fan-dabi-dozi' song too, you know. Anyway, moving on ... truth is that all the other things I tackled to try and make a living since leaving the jazz scene in the mid-60s - like record production and farming in Scotland (simultaneously), then growing oranges in Mallorca - left me neither time nor opportunity to play music, even as a hobby. All the same, it took years to get the buzz of playing jazz and its associated comradeship out of my system. I've been a published author since 2000, and it's a solitary job - the other end of the creative spectrum from playing in a band - but, with deadlines of a book-per-year to meet, it's another occupation that demands total commitment and unstinting dedication of time. That's been the story of my life in many respects, and I count myself lucky for it. Teaches you to keep on your toes and not to let the grass grow under your feet. For instance, during the twenty years that I was involved in record production (as a Scotland-based freelance for several UK and US majors), budgets for most of the ten or so albums a year I had to supply in order to earn a reasonable crust dictated that each album had to be completed in two three-hour sessions. Everyone had to know what they were doing, and I think the results were all the sharper for it. While variety was the spice of life musically, with artists ranging in style from Andy Stewart and Jimmy Shand to the Royal Scots Dragoon Guards and the aforementioned Krankies, the one regret I had was that there weren't more opportunities to record jazz: the only examples being three studio albums I produced in Edinburgh with the Alex Welsh Band - At Home with Alex Welsh, Alex Welsh and his Band '69 and The Alex Welsh Dixieland Party (all EMI) - goodies every one, with the band in top form. All I had to do to 'produce' the results was help the lads feel relaxed, set the balance and sit back and enjoy the music. Happy days! Listen to Lester Leaps In from the album Alex Welsh and his Band. 'Making them feel relaxed' seems to have worked! You have now become a pretty successful writer. How would you describe your style? I don't really see myself as an author at all, just a teller of wee stories that seem to roll on and self-develop until they end up as a book, always with a sprinkling of humour and a feel-good ending. I never have a pre-conceived plot, preferring to sit down in front of the computer in the morning and see what comes to mind. Maybe it's something that harks back to my jazz-playing days - improvisation and all that. Spookily, particularly with fiction, the characters, once established, tend to write themselves anyway; I just have to keep an eye on them and make sure they don't misbehave too much. That said, it can be hard work writing books that (hopefully) are easy to read and come across as having flowed from the pen. In attempting to achieve that end, I tend to go over and over and over every sentence, paragraph and page as I write. The aim is to find, not just the right combination of the right words, but to set them to a rhythm that, in jazz terms, swings a bit. I can't define that exactly, but I know when it happens - and it can be extremely elusive, believe me. Another common denominator with my jazz musician days is the requirement to go 'on the road', the length and breadth of the UK and sometimes far beyond. But instead of performing in jazz clubs and concert halls with six other guys to lean on, I have to entertain audiences as a 'solo', chatting about my books in situations as varied as small libraries, big book festivals and even cruise liners. I found it a bit daunting at first, but I've grown to really enjoy being given the opportunity to meet folks who have read my books and to get their feedback. It's extremely rewarding, all part of an endless learning curve, and always a lot of fun. 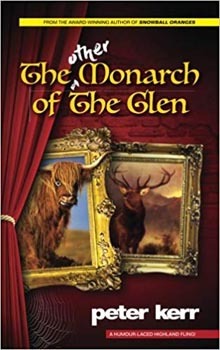 ‘The Other Monarch Of The Glen’ came out last year? What is it all about? This has been described as a quirky Caledonian caper. It's actually a comedy-laced yarn about two middle-aged wide boys from different rungs of the social ladder, who happen to be invited at the same time to a castle on the banks of Loch Ness by Lord Strathsporran, the seriously-skint local laird. The story is set at the start of the grouse-shooting season, and our two heroes find themselves in the company of a motley mix of fellow guests of various nationalities, all of whom are paying through the nose for the chance to bag a few birds. Fortune seems to favour the devious duo when an opportunity arises to pull off what promises to be an extremely lucrative scam. Consequently, Lord Strathsporran finds himself embroiled in a complicated scenario that is further compounded by amorous attractions crossing social barriers faster than a smart grouse would wing it off the moors at daybreak on the Glorious Twelfth. Chicanery stalks the corridors of Strathsporran Castle. But who's conning who? And what's all this got to do with jazz? Well, not a lot, until the background of the two central characters is revealed and they find they have a lot more in common than they could ever have imagined. Have you got another book in the pipe line? I'm currently tackling my first fantasy effort, a complete departure from anything I've written before. Genre-jumping is a trait in authors that publishers are wary of, but I've never been a fan of pigeon holes, which is maybe another throwback to my time as a jazz musician. I find it stifling to be hemmed in by 'classifications', and for inspiration I rely on having different paths to head down. Not an attitude easily accepted by the book-business establishment, perhaps, but I'd be faking it if I tried to be any other way. And, as with jazz fans, the book-reading public can spot a phony a mile away. 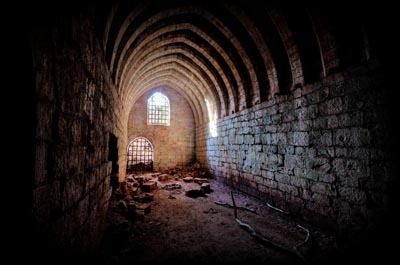 The idea for this book came from a ruined castle called Goblin Ha', near my home in East Lothian. I'm not sure if I'll be able to fit some jazz content into the world of bogeymen and elves, but stranger things have happened in the story so far. Hmm, I wonder if a could conjure up a cameo spot for Erroll Garner...? I read in The Scotsman that 'Yester’s Goblin Ha’ lies beneath the ground and can be entered via a doorway at the castle’s northern end. Many who have ventured down over the years have spoken of a sinister presence stalking the site, and a general feeling that they are not welcome'. Perhaps it is haunted! As for Erroll Garner, you could always play Misty! You are obviously still interested in jazz – who do you listen to these days? Thanks to the internet (and there's no jazz-dedicated site more comprehensive than your own), it's relatively easy to access what's currently being played and by whom, as well as being treated to some rare gems resurrected from the past. However, these days most of my listening is done while I'm working - i.e. background music to the click of computer keys and the clunk of brain cells - so easy-listening piano jazz fits the bill nicely. Now that I think about it, the people I currently listen to in that regard are pretty much the same ones I was listening to fifty years ago: pianists like Teddy Wilson, Oscar Peterson and 'The Elf' himself, with even a blast of Albert Ammons if I need an energy boost. Also, horn man Wild Bill Davison produced some smooth 'wallpaper' with strings attached, and, to quote Eddie Condon, 'that doesn't bother me' either when I'm working. When there are no writing distractions to get in the way, I still get a kick out of listening to Dixieland. As Bing Crosby said, there's nothing like Dixieland to brighten up the cloudiest of days - or words to that effect. And the albums I listen to most are the likes of Jack Teagarden and Bobby Hackett's 'Jazz Ultimate' and 'Coast Concert', along with Eddie Condon's Jam Session Coast to Coast' and Jammin' at Condon's'. They involve a real star-spangled array of some of the best-ever exponents of the idiom - Ed Hall, Peanuts Hucko, Cutty Cutshall, Lou McGarity, Wild Bill, Billy Butterfield, Matty Matlock, Nick Fatool et al. Undeniably all-American, of course, yet the one recording I've listened to and admired more than any other over the years features predominantly British musicians: 'That Old Feeling' was recorded in London as a clarinet duet by Sandy Brown and Archie Semple back in 1959, with Fred Hunt on piano, Jackie Dougan on drums and Canada's Jack Fallon on bass. I sing its praises, not because the two front men happened to hail from the same part of Scotland as myself, but simply because I think it is a unique example of classy, understated jazz elegance. Not strictly Dixieland? That's right, but who needs pigeon holes anyway? Listen to That Old Feeling with Sandy Brown and Archie Semple. Well, I better let you get back and sharpen your quill and refill your ink bottle. I think I might play some Erroll Garner, 'The Giant Elf'. Would you like another biscuit before you go? Thanks, Ian - very kind of you. And, um, I reckon I've limited myself to the healthy option more than enough for one day, so just lob me one of your deep fried Mars Bars, please. But, hey, no offence ... hold the pickled onions, eh! Click here for Peter's website.